Today I will review another great site which paid me twice.It is a get paid to surf site with friendly admin,great design.It is none other than rainbow-traffic.com which have completed one year online journey in January 15,2010. 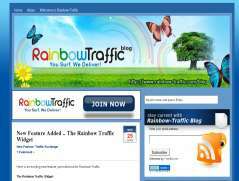 Rainbow-traffic has more 5000 members. You can join here for free to make money online. It is also a manual traffic exchange site where you can advertise your blogs to get traffic,promote your products to thousands of members.And for all these you don’t have to spend a penny from your pocket.you can use your earnings for advertisement.So getting traffic for your site or selling something to others is not a difficult task now.Another important thing you can make money here without referrals. Referrals gives you only credits and a percentage of what money they spend on the site. As a free member you can surf maximum 1000 pages daily.You will get $.05 for every 50 pages you visit.Upgraded members can visit unlimited pages daily. There are also some cool weekly contests where you can win upto $5. Are there any minimum payout? Answer is yes. The minimum payout is $10. It is easy to reach.Once you reach your minimum payout You can request your payout through PayPal or alert pay.